The last hit that takes your golf ball into the hole needs to be perfect. And for that perfect, finishing hit you need the perfect iron club and that produces the perfect shot and force to take you one more step closer to your trophy. Welcome to our article, today we will be doing a tour striker 7 iron review. There’s a lot of engineering goodness that goes into the making of a good and proper iron club. However, not all of them manage to synchronize with the player and the ball as you’d expect them to. Let’s find out of the tour striker 7 iron has what it takes to show some magic on the course. Before we start, we have to also tell you that this Tour Striker didn’t make it to our list of the best golf drivers as there were a few better ones out there. However, this is still a very good unit to go for. Now, to start this review of Two Striker 7 Iron, we are going to look at the features of this unit. As you can read from the title already, the tour striker 7 iron club is one in the short iron categories. In other words, the shaft of the club gets shorter while the loft increases. This consequently gives the player a closer hit at the base of the ball causing it propel higher and shorter lengths. It is ideal for when you are approaching the green. The company and makers deem the tour striker 7 iron to be ideal for lower handicappers and for anyone who fails to ace the sweet spot of the iron. We will be the judge of that, Tour Strikes. the club has a red and white face with the company name on it. One thing our tour striker 7 iron review would like to clear out right away is that this club is vastly used for training purposes only. You, as a golfer, should know by know that hitting the sweet spot of the club and then hitting it in harmony with the ball is as real as hunting for dragons. In other words, it touches; even professionals struggle with it. The tour striker 7 iron has is help the intermediate learner to get their hand in the proper impact position, correct imposture and take control. The tour striker 7 iron is made from 433 stainless steel and come with True Temper, Uniflex steel shaft. With a total length of 37 inches, it is easy to hold and swing. And the loft angle of 35 degrees and lie angle of 62 degrees does wonders to getting your aim right. You are probably going to hit the sweet spot of the club’s face the very first few times you swing the tour striker 7 iron. Apart from these, the grip on the iron 7 club is a rubber cross line round which makes you hand are comfortable, more controllable and even with every swing. It delays fatigue and has a great strong adherence to your palms. You probably know already how it feels on the hands, but how good does it look in it? The club has a red and white face with the company name on it. The shaft and face is other than that, all silver and sleek and has a black rubber handle. There are grooves on the face that balance and spike the golf ball for those short and heightened bursts of shot. It feels great and it looks good. Well, the answer to that is both a yes and a no. This is because we have come across a few buyers who saw no difference it their ain and shots, They felt it was a gimmick, a strain, difficult to use, the usual angry, unsatisfied costumer slurs go on. On the other hand however, we have also seen a striking number of customers who immediately felt and witnessed a changed and improvement in their swinging style. For us, personally, we do believe that since the design of the tour striker 7 iron has been manipulated and created to correct your hits, and then complement it. But yet again, there are always reason why a product may work for you and not your neighbor the same way! 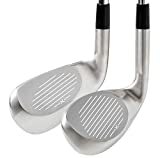 Does the tour striker 7 iron come with any teaching manual or DVD guide on how to master the techniques? Answer: Yes, it does come with a DVDV which shows you and walks you through all the 1, 2, 3 and hows tos of the problems. Is there another iron club from the Tour Strike like the striker 7 iron that people can test too? Answer: Yes, there is. The tour striker 7 iron is in fact a rendition, and improved sequel to the 2014 Tour Striker Golf Swing Trainer Club. Keep in mind that that sequels exists to outdo their previous models. In other words, the tour striker 7 iron is a redesign and a better version of the base model. It has a more calculated and smart club that which the company makes keeping in mind all the troubles faced in the first one. Just letting you know since this may concern you later after purchase.. . The tour striker 7 iron is a training club, and whether it truly work or not will eventually depend on your, your efforts and hard work. We, on the other hand, have some high hopes for it. It is a perfect balance of design and physics that help problematic players. On the contrary, we must say that you may not see instant results just yet from it. It is something you have to work on a regular basis to hit the bull’s eye. Until them, we say give the tour striker 7 iron a shot. It’s optimistic and is affordable so no harm done there. We recommend it. This concludes our tour striker 7 iron review. For more details, click on the link. We will see you next time.